Downtown Pittsburgh abounds with great nightlife destinations, and Olive or Dive, along Sixth Street a stone’s throw from the river and many of the most exciting downtown venues, is among them. This spot offers a classy mix of martinis and live music to go with its upscale concept. With a section for a lively bar to listen to local acts, as well as a dining area that still feels intimate, this spot knows what to do with a compact space. It’s a nice spot for a date or a group of friends, at the same time. Lavender Lemon Drop: An even mix of Absolut Hibiskus and a splash of Creme de Violette it’s the lemon that nonetheless guides the flavor here. The Dark Knight: This cocktail is a mix of Creme de Violette, St. Germaine and Hendricks, accentuated with a bit of Lemon. It touches the bitter side but still remains sturdy on its own. Chocolate Covered Pretzel: Decidedly more of a dessert cocktail, this one has got Pinnacle Chocolate Whipped Vodka and Frangelico, with a light Amaretto to follow. It’s got the chocolate syrup and plenty of salt on the rim to really activate your taste buds. Sweet and salty are dominant. The food menu is a mix of lighter bistro items, take for instance the Caesar salad which is topped with simple croutons and a creamy citrus sauce, and large leaf salad. I’m also a fan of that three-cheese sandwich which has a bit of tomato in it, and which is served alongside a thick tomato basil soup. In practice the soup is much more evocative of a bisque, and so it’s a great dish overall. The spot has great service and a very professional wait staff. The concept is pretty evenly split, with the front bar area popular with people looking for drinks, and the back area definitely more for dining. Of course the two can mix with varying levels of success depending on the crowd, but still I found the back to be pleasant enough to dine in and feel intimate even as the front saw a crowd. The price points here are also a little higher, but it’s definitely worth the price; the drinks are strong, the quality of the ingredients is there. All in all, I found the spot a very pleasant experience, and a nice addition to the overall dining scene in Pittsburgh. It’s a cozy little spot, and one that seems to be especially popular with couples, and my experiences here were positive. The drinks are priced a bit above normal, but they are worth the price, a few will take you a long way. 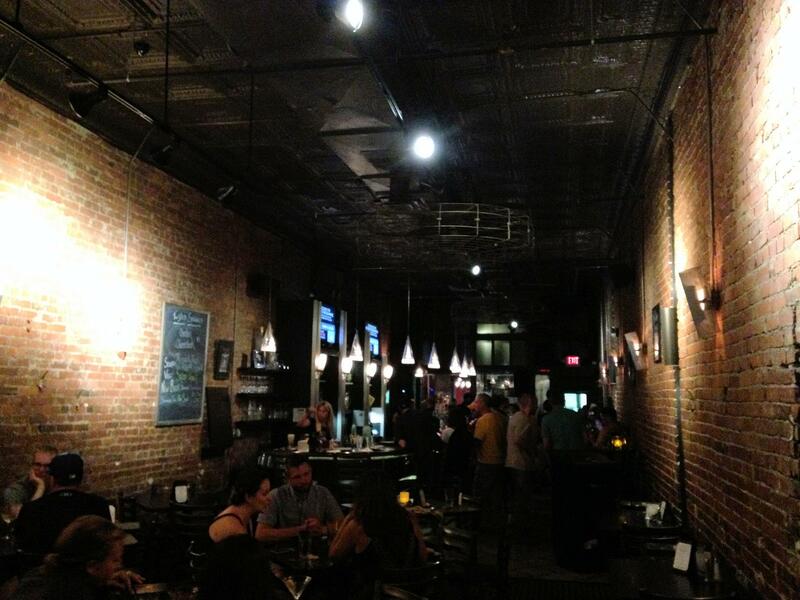 The interior here features a lively drink bar with live music. But the back is a dining destination, and I would say you’ll find either concept enjoyable. Highly recommend the cocktails over the beer or wine menu. Posted in 4 stars, bar, bistro, pittsburgh areaTagged grilled cheese, martini, salad, tomato bisqueBookmark the permalink.